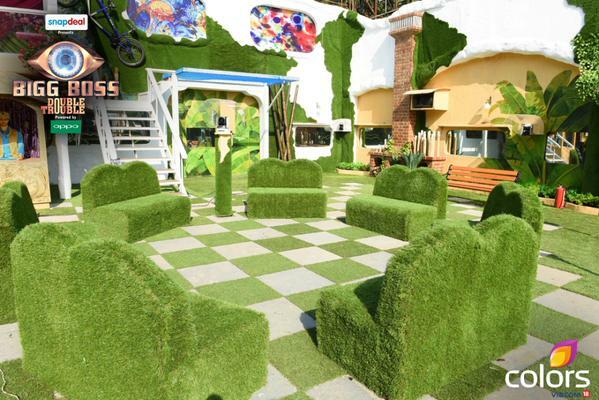 The Home of Bigg Boss Season 9 also called as Big Boss Nau has swanky and plush interiors this time. It has shades of pink, green, turquoise green, blue, red spread all over. The house also has a lot of mirrors. 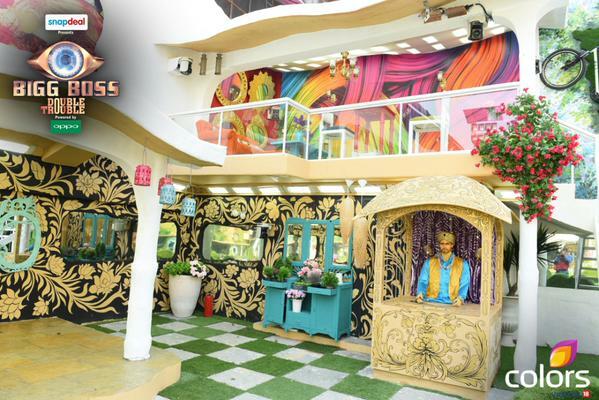 This luxurious home, filled with outlandish and theatrical elements, for the contestants’ stay during the next 100+ days has been specially designed by art director Omung Kumar. There’s this sofa, which is in the shape of lips. 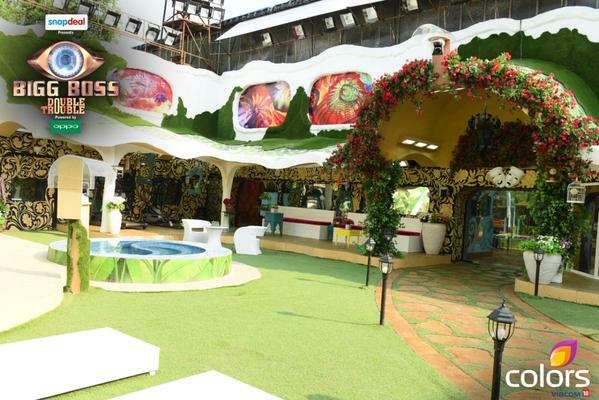 The garden area where contestants spend most of the time is designed as per the theme Double Trouble. The garden has green and white checkered lawn with green double chairs. In the bedroom all the beds are in a single row with two single beds attached to each other to accommodate a jodi. 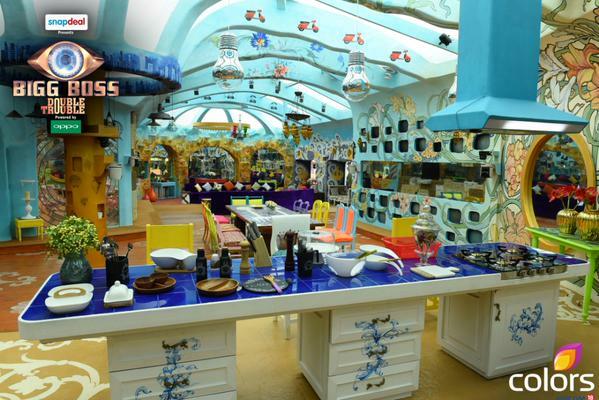 Kitchen area is THE place of the Bigg Boss House. This is the place where most of the ruthless politics takes place – the kitchen area in designed with white and blue colours. The dining table chairs are designed to accommodate two contestants. 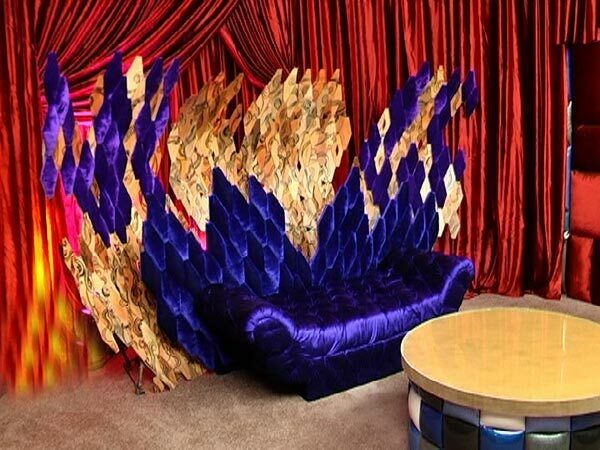 The confession room where conversations with the Bigg Boss happen is done in bright colours accentuated with the blue and gold confession chair, which is big enough to accommodate two contestants at a time. Bathrooms in the house where contestants come to look for some respite but hardly find it. Often bathroom see a lot of action, conflicts and quarrels. 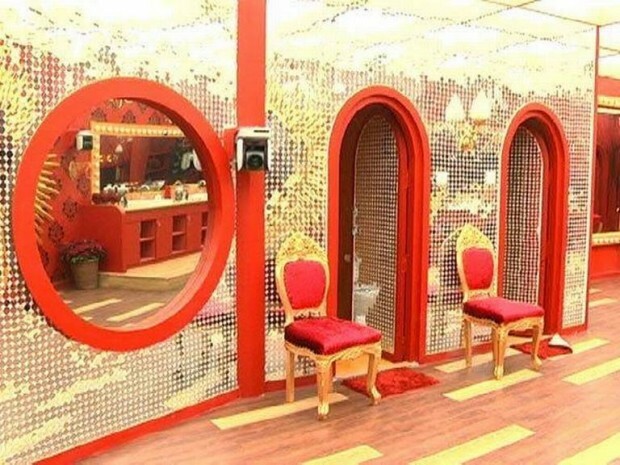 Rightly so, the bathrooms in Bigg Boss Nau have been made very dramatic. It has a Moulin Rouge theme with large mirrors along with shades of red and gold to create a truly theatrical imagery. This time, there’s an additional feature in the Bigg Boss House. Yes, it’s a Jacuzzi. Shaped like a yin yang, the Jacuzzi will calm the nerves and provide the much needed TLC for the contestants. Given the swanky and luxurious interiors, it is almost worth being put under house arrest in this house of Bigg Boss Nau.